I'll give it a try. (= This is indeed a cool problem. 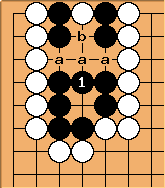 If white plays at any of the three points marked a, black captures at b, making the second eye, and the remaining two a points are miai to connect the eyes. 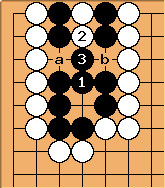 Comment: If white plays at the middle a, black could also play on one of the side a, making b and the remaining a miai. White has then the same amount of threats, but black has the chance to gain two additional points later if white tenukis. 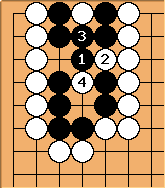 If white plays instead, black must capture with . Black then captures the throw-in at and a and b are miai. After there is no way for black to make a second eye. at fails in similar fashion. After , takes away the second eye. Playing at a does not help; black can capture but still does not get a second eye. 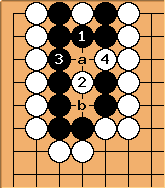 Playing at b does not help either since white has enough time to escape. does not work either: after the exchange of and , the throw-in at dashes black's hopes for a second eye.